Today we get to announce the ten winners from this month’s challenge! To make it easier for winners to know it’s them, I’m going to include graphics with their comments. Ladies, please email us at ablognamedhero at gmail dot com with your mailing address. Include “november winner” in the subject line please. We will get your prizes out to you right away. A holiday card challenge, tribute to our fantastic sponsors and lots of great prizes are found on our blog this month. 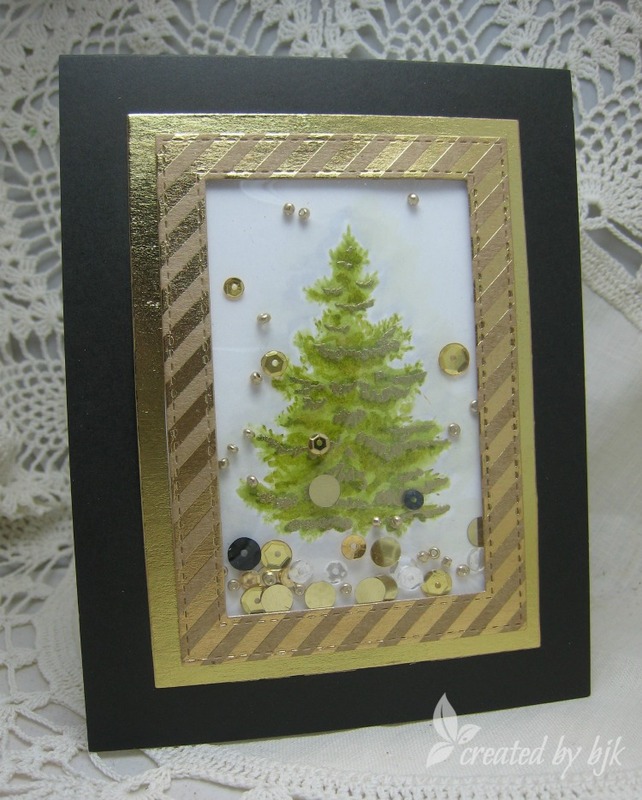 My shaker card today uses the lovely coloring layering tree stamped in shades of green and embossed in gold. Shading around the tree was done with a Zig marker and a little water. The sequins are some that I received from The Ton when they sponsored us earlier in the year. The golden paper is from Target’s $$ bins and then all mounted on a black base. As part of our thanks to our sponsors and you, our followers, there are prizes from each of the DT members – just leave a comment on our posts and/or add a card to our holiday challenge – here or in the upper right corner. Thanks for stopping by today and love to read your kind comments. Hi friends – my very last post for A Blog Named Hero – what an INCREDIBLE journey this has been; thanks for having me! And since I am forever asked to make ‘Thank You’ cards, that’s what I set off to make using 4 different stamp sets, 3 different companies. I was so inspired by THIS card but I don’t own any Dr. Ph Martins so I set about making the same sort of card using various distress ink markers sprayed with water. I even added some black details like Eunji has in her card, but mine are hand drawn. I die cut the HELLO from water color paper, adhered to some white and black card stock for dimension, sponged with distress ink and coated with glossy accents. A black sentiment flag and some simple black/white graphic paper finish it off. Thanks for stopping by; don’t forget, EACH team member is giving away a prize – that’s ten prizes up for grab. Leave some love for each and every blog post! Hello, Jess here to share a bright and cheerful holiday card! 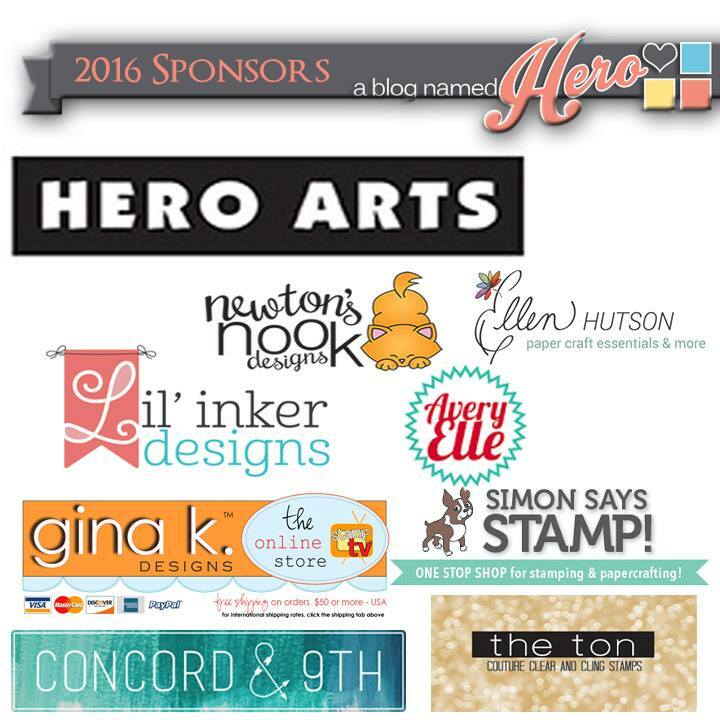 Before I get started I just wanted to take a moment to thank all of our wonderful 2016 sponsors for a fabulous year!! My final card for the month features Hero Arts and Concord & 9th! 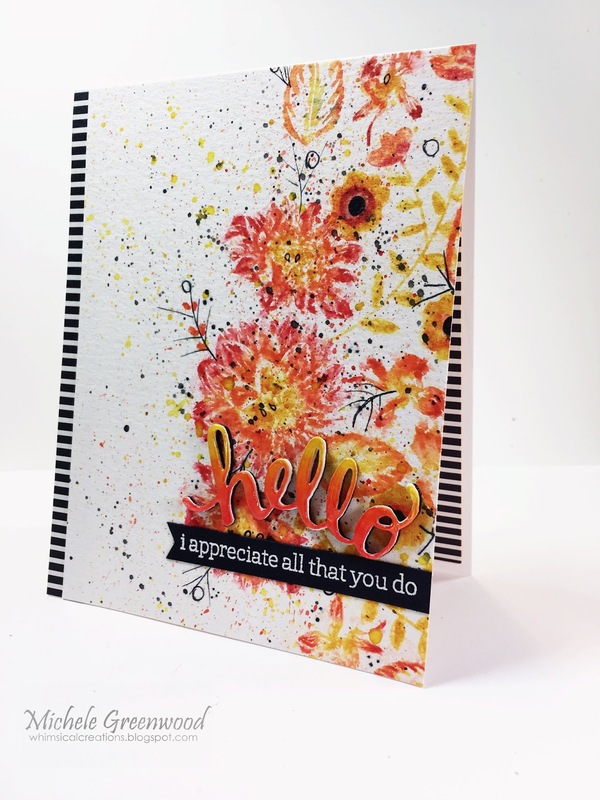 Unfortunately I seem to have used a discontinued background stamp (though it can still be found on eBay and a few other online shops) but you can also create a similar card using any of the beautiful background stamps from Hero Arts! To start I blended abandoned coral, picked raspberry, festive berries, and ripe persimmon distress ink on a piece of white cardstock. Then I spritzed it with water a few times to get lighter spots. I dried it with a heat gun and then stamped the background stamp with versamark and heat-embossed it with gold embossing powder. Next I stamped the sentiment from Concord & 9th with versamark and heat-embossed it with the same gold embossing powder. I die-cut it with a stitched frame and then adhered it to the background panel over a tangle of gold thread. I hope you’ve enjoyed my cards this year and thanks to all of you for helping to make A Blog Named Hero so much fun! 🙂 Have a wonderful holiday season! !